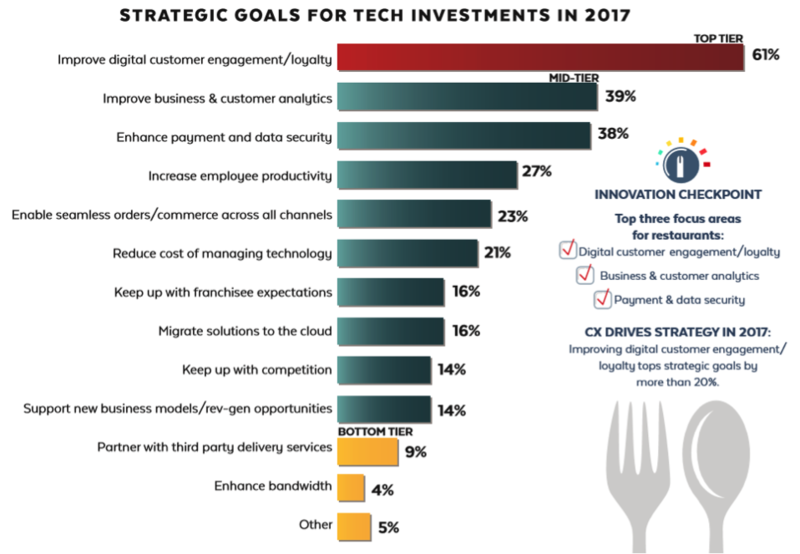 Digital engagement has become the top IT priority for restaurants according to the 2017 Technology Budgets & Allocations report by Hospitality Technology (HT). As restaurants are still trying to understand the value of different IT solutions, digital customer engagement overtook efficiency as their top IT objective for the first time in more than 10 years. After a decade of relative indifference, restaurant have embraced the idea that customer experience rather than operational efficiency will be the most important factor in their success. With most customers are now equipped with mobile devices, making it easier for patrons to order and pay for their food and beverages while in the venue will help drive revenues and profits. The underlying enabler for many of these digital functions is guest Wi-Fi. As shown in the graph below, guest Wi-Fi remains at the top of the innovation agenda for restaurants. The free wireless connectivity already serves to draw customers into restaurants, and can be leveraged further by restaurant owners to convince customers to come back time and again. Starbucks’ CEO Howard Schultz sees the success of his company’s brand being driven principally by its “global leadership in mobile, digital, and loyalty”. As shown in the next graph highlighting the 2017 strategic goals, 61% of restaurant owners are pursuing further digital customer engagement and loyalty as their top priority. The next item on the priority list, improving business and customer analytics at 39%, merits attention too, but for other reasons. Restaurant owners acknowledge that analytics can be key to creating the experiences that customers want, but lack confidence in their current use of the data. Even if one out of four restaurants surveyed by HT thinks it is a leader in innovation, there is a gap to bridge between collecting analytics and business advantage. Any solution to help restaurants increase digital proximity with customers and leverage the data collected must therefore offer ease of use, as well as affordability. Restaurants, whether individual or chain locations, seldom have dedicated IT staff on site. They are even less likely to have specialist data analysts. IT solution providers must therefore meet the restaurants where the restaurants are, in terms of usability and clear return on investment. The CaptiveXS solution from RaGaPa has been designed to satisfy these criteria. It offers restaurant owners and operators the possibility to send information and promotions to customers over guest Wi-Fi connections, and collect and immediately use the data from those connections afterwards. Special meal deals, loyalty coupons, satisfaction surveys, and partner business promotions (such as neighboring stores, malls, or other venues) are examples of content that can be inserted into the Wi-Fi connections. In addition, mobile app experiences can be offered to customers within their mobile browsers. Examples include ordering, steering clear of food allergies, and even helping customers pass the time while their orders arrive. Data can then be automatically gathered on the customer connection profiles and behavior, such as numbers of clicks on advertisements or other content. CaptiveXS displays practical analytics that show restaurant operators right away how well their actions to engage customers are doing. CaptiveXS is also equipped for a new digital environment in restaurants, the Internet of Things. Customers are branching out towards different kinds of connected items, including wearables and monitors for counting calories, checking on diets and fitness, and knowing that their children are still safely within the restaurant play area. IoT devices must be correctly handled by the guest Wi-Fi network, with unwelcome devices being quarantined or excluded, to maintain the performance and security of the network for restaurant-goers. There is an increasing awareness that loyalty, digital experiences, and guest satisfaction are all driven by decisions founded on the right data and analytics. Guest Wi-Fi enables restaurants to collect such data, on condition that the Wi-Fi network itself is properly deployed and managed. As restaurants prepare to tackle the digital opportunities and challenges ahead, they should be encouraged by the availability of guest Wi-Fi solutions like CaptiveXS that make analytics accessible and digital engagement a main ingredient in digital dining.